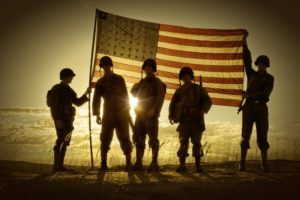 Veteran/Military Friendly Congregations – Page 4 – Congregation and ministry support for military, veterans and their families. A high risk suicidal justice involved veteran graduate gives thanks to God, Monroe County Veterans Court Judge Thomas, Helen Ross McNabb Military Services Center Clinical Therapist Tony Weaver, VA Knoxville Outpatient Clinic Debbie Cohan & Christy Cook, Vet to Vet Tennessee (VTVT) mentors and Pastor Chris Moore, First Baptist Church of Madisonville for saving his life. Robert retired from the US Air Force after 20 years and 9 months of honorable service and is a past VFW Post Commander. Robert entered the program on January 25, 2018 and needed much more than legal help. McNabb’s Clinical Therapist Tony Weaver summed up Robert’s status in a email he sent to VTVT. “I am very excited to inform you that R.B. 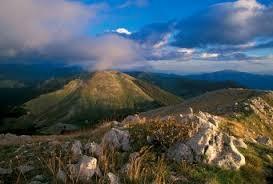 has completed the goals of his treatment plan at Helen Ross McNabb Military Services. Since admittance into this program the transformation R.B. has undergone has been incredibly awe-inspiring if not, nothing short of a miraculous turn around. During his intake, I heart-wrenchingly listened to R.B.’s words as they reflected absolute and utter hopelessness and dejection. Hearing him talk, his future outlook was one of the bleakest I had ever heard. His final words to me that day before slowly exiting my office captured the very essence of his mind as he reported, “I’m tired of hurting. This is something nobody can fix; I’m stuck with it.” R.B. added, “I don’t think this (treatment) will work . . . but I am willing to try.” I am so very glad he tried. During the ceremony, Robert thanked everyone especially God for saving his life. He said his life dramatically changed when he volunteered at VTVT’s Expungement Clinic hosted Veteran/Military Friendly Congregation First Baptist Church of Madisonville as he worked alongside of Pastor Moore. God bless you Robert! Thanks for the hard work and for living. Click here to view more graduation photos. This week’s column focuses on the Veteran Military Friendly Congregation Ministry of the MCA (VMFC). This ministry we inherited nearly two years ago has shown some remarkable growth in the last two months, thanks to the great teamwork of CH Ron Skaggs, working with Everett Price of the Episcopal Church’s Brotherhood of St Andrew, Ed Junod, the President of Vet to Vet Tennessee and Jack Figel, the MCA Deputy Executive Director. I know of at least two congregations who would be great additions to this list, one in northern Virginia, and one in the Minneapolis-St. Paul area, and those are ones that immediately jump to mind. If you have any suggestions for congregations that would be a good fit, please contact Ron at 1stSgtSkaggs@gmail.com, Everett Price at evpricega@yahoo.com or Ed Junod at ejunod@tnvhc.org . 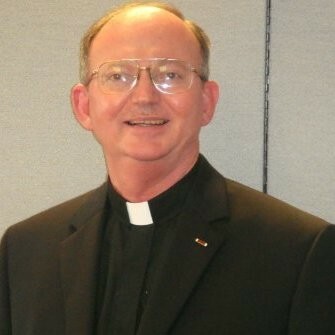 I will next be attending the joint annual meeting the end of this week of The Association of Professional Chaplains (APC) and The National Association of Catholic Chaplains (NACC) in Anaheim,. Representing MCA beside myself will be our President, Chaplain Mike Langston, and Chaplain Jan McCormack. I will report back next week on what is happening with the advanced certification for profession military chaplains, and some of what Jan, Mike and I have done on behalf of MCA while we are there. Click here to view the entire newsgram. 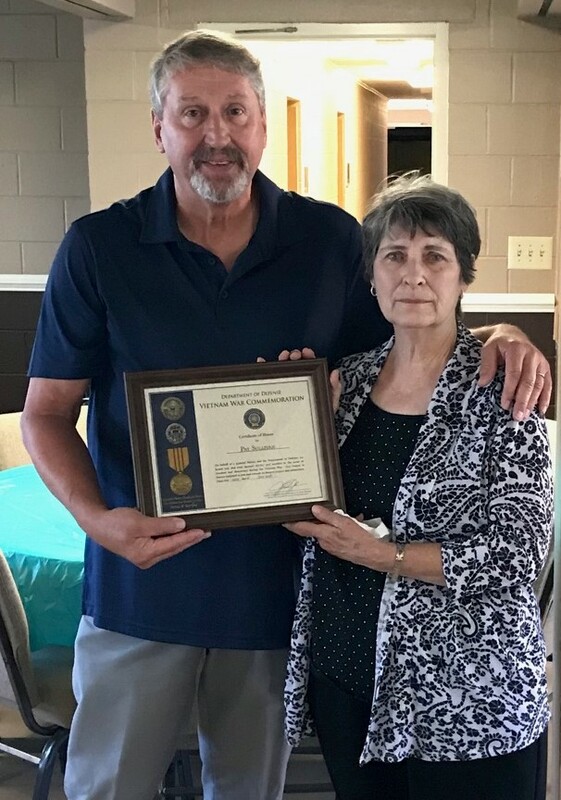 Ray Wease, Lay Leader of Crossroads United Methodist Church of Concord North Carolina, travels to Manchester Ohio to present the Vietnam War Commemoration Certificate of Honor to Ms. Pat Sullivan. “Here is a pic of me presenting the Vietnam surviving spouse award to Ms. Pat Sullivan (Larry Sullivan was the Vietnam vet who served in Vietnam in 1967-68). This presentation happened on Saturday, July 7, 2018 in Manchester Ohio. It was an honor for me to do this for my friends of over 50 years.” Ray Wease [read more=”Click here to Read More” less=”Read Less”] Bless you Ray for loving our brothers and sisters. Pastor Lowell McNaney enrolled Crossroad UMC into the VFMC network on August 7, 2017 and publicly recognized military, veteran and veteran surviving spouse Crossroads UMC Recognition of Congregation Veterans post. Recognition of Congregation Veterans/Military and their spouse is one of the recommended programs in the VMFC basic manual. If you are interested in recognizes your veteran members, please contact Vet to Vet Tennessee to learn more about the program. 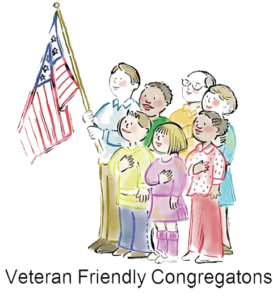 As Vietnam War Commemoration partner, VTVT will be honored to provide your VMFC with free VWC material including the Presidential Proclamation and lapel pin. Welcome Home Mr. Henry Hunter Jr. from Fountain City, TN! On July 7, 2017 Vet to Vet Tennessee received an emailed from Agostino Alberti, a Lombardy Italian teacher and a member of the archaeological group Air Crash Po, about a WWII American Airman dog tag found in wooded, Apennines mountains area of Italy. According to Ago, his “friend Tommaso Teora was investigating a wooded area “between Lucca and Pistoia”, looking for the crash-point of a B-17F bomber which was shot down during a bombing mission over the Bologna main M/Y on October 3, 1943 and he and another researcher named Francesco Pioli have found the dog tag.” According to Mr. Hunter’s family, Mr. Hunter and his crew made a raft using the wing of the craft, and they floated down the river until they met up with Italian partisans who assisted them in returning to American forces. 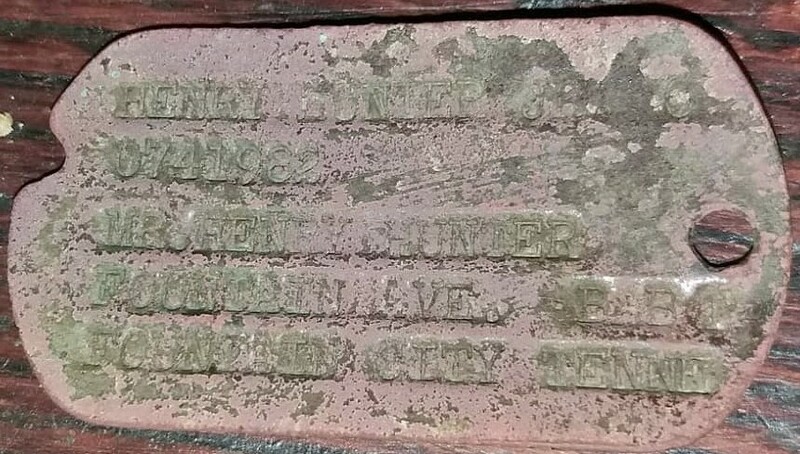 Through our partnerships with the Knox County Mayor’s Office and one of our Veteran/Military Friendly Congregations Fountain City United Methodist Church, and a local mortician and military history enthusiast, Mr. Hunter’s family was found. Such an honor to assist in bringing an artifact home from our soldiers and inform his family. We are grateful and honored to Agostino Alberti, Tommaso Teora, Francesco Pioli, Luca Merli, Jeff Berry, Buzz Buswell, Fountain City United Methodist Pastor John Gargis and www.tnvhc.org for bringing all of this together. We are truly blessed. MCA received an online enrollment request from Saint Anne Episcopal from DeSoto Texas. Reverend Dr. James Harris is the Church Rector and Charla Truesdale is their Lay Leader. If you would like to enroll your church or ministry, please click here. Trinity Health Foundation of East Tennessee awarded a 2018 Phase I grant to Vet to Vet Tennessee (VTVT) for their initiative “Veteran/First Responder QPR Suicide Prevention on June 6, 2018 at the Cherokee Country Club. 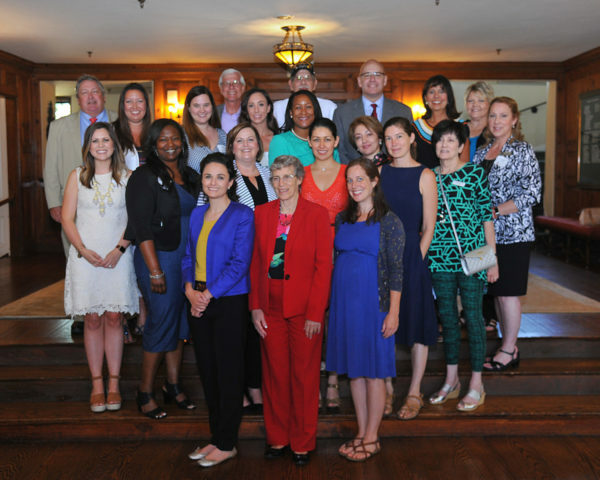 Trinity Health Foundation of East Tennessee extends the healing ministry of Jesus by improving the physical, emotional and spiritual health of our community. Each grantee is assigned a Trinity Health Foundation Liaison; VTVT was assigned – The Very Reverend John Ross and Joe Johnson. VTVT is offering 20 $500.00 QPR Suicide Prevention Instructor training scholarship thanks to the generosity of Trinity, Knox County Mayor Tim Burchett and VTVT members. The scholarships are offered to all active VMFCs . The Phase I Final Report and Phase II Proposal is due on September 5, 2018. The Phase II grant is worth $50,000.00 and due in September. If approved, VTVT to train 100 VMFCs, faith-based communities and non-VA mental health care provider members. Phase 2 grant will focus on training youth leaders because suicide is the 2nd leading cause of death of ages 15-24. If you would like to learn more about suicide prevention please leave us a message below. 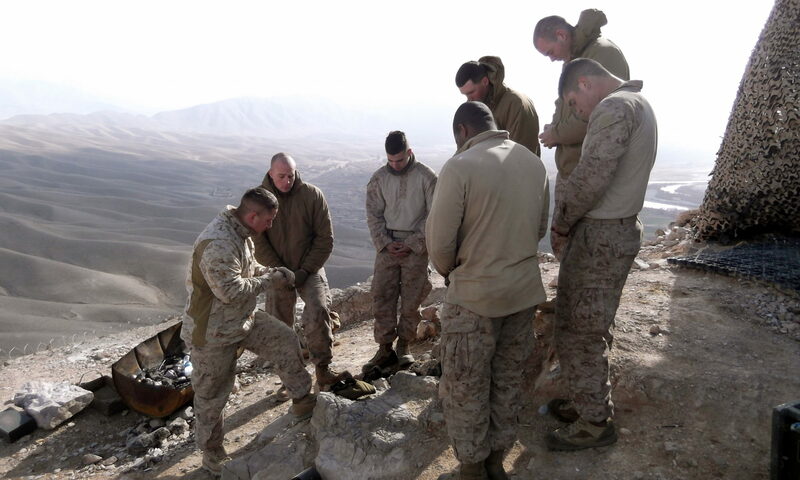 Pray and work…for God and Country. Veteran/Military Friendly Congregations (VMFCs) are worshipping congregations and communities which consciously and visibly seek to be friendly to veterans, military members, and their families. This is a ministry of the MCA which we received from Care for the Troops in 2016 and which has shown great promise as we make it known around the nation. The VMFC ministry got a shot in the arm with a phone conference on May 2nd at the National Executive Committee (NEC) meeting when Everett Price called in to see what could be done by us partnering with another the Brotherhood of St. Andrew, which is an Episcopalian organization established for lay men in the Episcopal Church. Ev serves as the Vice President, Military Affairs, for the Brotherhood of St. Andrew and after the call MCA President, Chaplain Mike Langston appointed Chaplains Matt Woodbery, Ron Skaggs, Donnie Hays, Clifton Montgomery, and Phil Clark to explore how we might go about furthering this partnership and advancing this needed ministry in our nations congregations. As it turned out, it also included partnering with Ed Junod, the President of Vet to Vet Tennessee, which has also been attempting to do the same thing. After a flurry of emails between Ev, Ron and Ed, along with some excellent suggestions from Jack Figel, the MCA office administrator, the VMFC ministry is advancing at a rapid pace. As noted earlier, we are currently in the process of re-designing the website and looking at additional social media ways to connect with chaplains, and also with those who might want to keep initiatives such as these in front of chaplains. Having a network of congregations across the country who understand the challenges facing those who serve, or have served, in the military has been a goal of MCA that has had some starts and stops over the years. 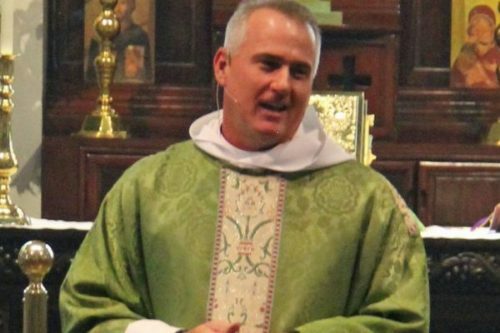 It now appears that using a “team of teams” approach between MCA, the Brotherhood of St. Andrew, and Vet to Vet Tennessee is paying dividends. We look forward to adding to the team as we go forward. One of the things I learned very quickly as a General Officer is that there is remarkable wealth in the people and organizations who want to help and support the military. Getting them all talking with each other, however, is indeed a challenge. The recent events in the VMFC ministry are certainly steps in the right direction. If any of you are aware of any congregations who want to step up to the plate and are supportive of military families, veterans and their families, please let Matt Woodbery, Ron Skaggs and Ev Price know at, respectively, mwoodbery@hotmail.com, 1stSgtSkaggs@gmail.com or evpricega@gmail.com. 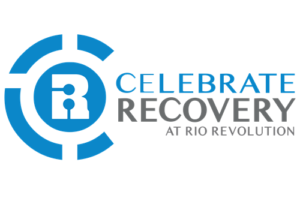 On May 8, 2018 Rio Revolution Celebrate Recovery began a “Welcome Home” share group led by Celebrate Recovery (CR) National Welcome Home Director Al North. CR has been a successful Christ Centered 12 step program for over 25 years in over 29,000 congregations worldwide. Welcome Home is a new initiative by CR to identify veterans, military and their families and create Welcome Home share groups in existing CRs. 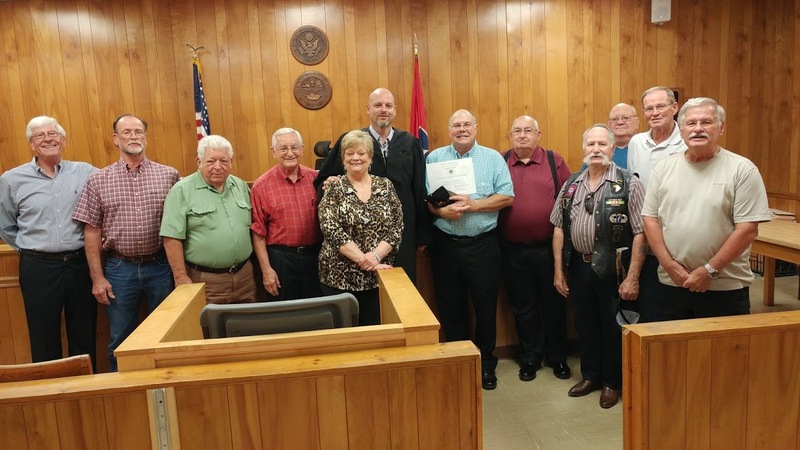 On May 10, 2018, Rio CR enrolled in the Veteran/Military Friendly Ministry program and becomes the sixth CR ministry in Eastern Tennessee. Vet to Vet Tennessee President and Director North agreed to expand the Welcome Home program and encourage existing and new CRs to enroll in the Military Chaplain Association VMFC program. God gave Pastor Pacer Hepperly a dream of planting a church with a simple goal: to help people connect with God in order to reach their full potential. 39 people committed to help Pastor Pacer fulfill his dream and make it a reality. The first service was held at a local high school on January 7, 2007, with over 200 people in attendance. Since then, God has blessed his church with steady incredible growth. Vet to Vet Tennessee has partnered with the Rio Church beginning with the 49th Blount County Veterans Day on November 11, 2017. 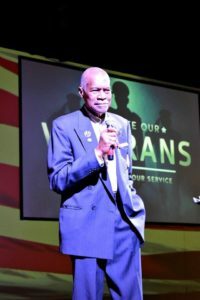 The guest speaker at the event was VTVT President Freddie J. Owens, who passed away on Good Friday 2018. His message included asking everyone to help find our veterans and their families and support improving the mind, body and spirit. Pastor Pacer realized that our community needs to do more with the mind and body and an instant partnership was formed. On May 8th, Rio Revolution Church Executive Pastor of Administration Devin Lipsey and VTVT President Ed Junod discussed VTVT’s Expungement Clinic program. According to Pastor Devin, this type of program is exactly the mission of Rio and would love to participate in a clinic in Blount County. Pastor Devin and Ed agreed to pray on the opportunity. Two days after the conversation, Rio Revolution enrolled as a VMFC. 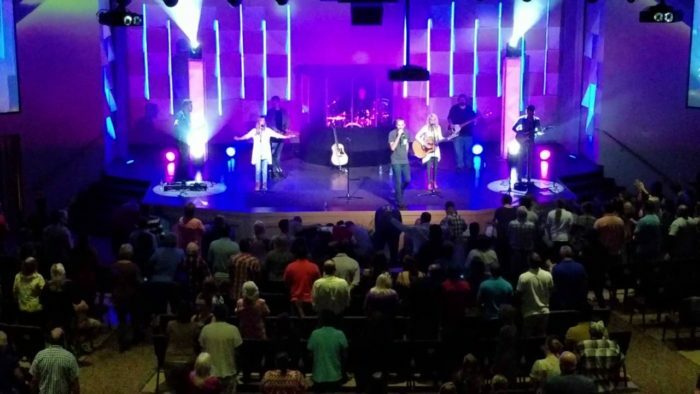 Please welcome Rio Revolution Church as our newest member. On October 12, 2017 Vet to Vet Tennessee announced their new collaborative veterans housing program with Blount County Habitat for Humanity (BHfH) and Maryville AMVETS Post 22 (Post). “Repairs for Heroes”; repairs veterans/military mind, body, spirit and home. Vet to Vet Tennessee trains mentors to interview veterans who need support including health & medical support, VA claims, suicide prevention and spiritual help. The spiritual help is provided by VA Chaplain Services, Veteran/Military Friendly Congregations, Blount County Habitat for Humanity and Vet to Vet Tennessee. These programs would not have been possible without the generosity and labor of the members of the Maryville Amvets Post 22. We also want to thank Joe Rainwater for his construction leader and project management. 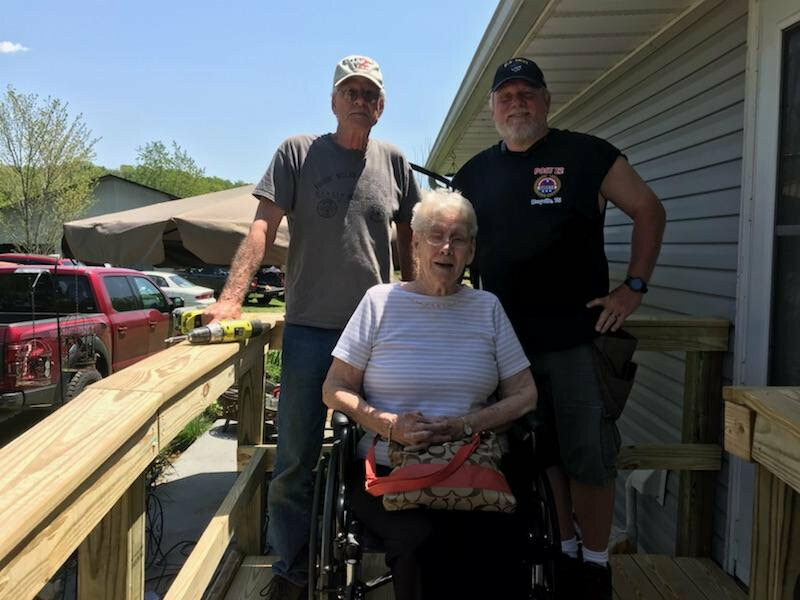 The featured image includes (left to right) Vet to Vet Tennessee (VTVT) President Ed Junod, veteran widow Betty Watson and Amvets Post 22 Commander Mark Frederick. RFH team are now conducting after action reports after the completion of the project. First lessons learned: We have a GREAT team! Several improvements in the construction process were identified and will be implemented in the future project including quality control. Special recognition to Lowe’s for providing a substantial discount for Mrs. Watson ramp. VTVT and Amvets Post 22 will be introducing the RFH program at the upcoming Amvets Tennessee convention in June 2018. The convention will be held at the Glenstone Lodge in Gatlinburg TN from June 7th to the 10th.